The policies in this section focus on methods to ensure that vehicle traffic, busing and transit, and walking and bicycling to school is conducted in the safest and most efficient way possible. Many of the identified policies focus on vehicle pick-up and drop-off activities. Implementing policies can often be very low cost, although they may involve a greater outlay of staff resources and new procedures may take some time to gain acceptance. Creation of a parent drop-off/pick-up “loop” can help maximize capacity and safety and minimize delay in drop-off and pick-up operations. The loop can be either a dedicated lane just for pick-up/drop-off, or a portion of the larger parking lot that has been marked with cones to serve as the pick-up/drop-off loop. Having supervisors present can help to ensure that loading/unloading moves forward smoothly, efficiently and safely. 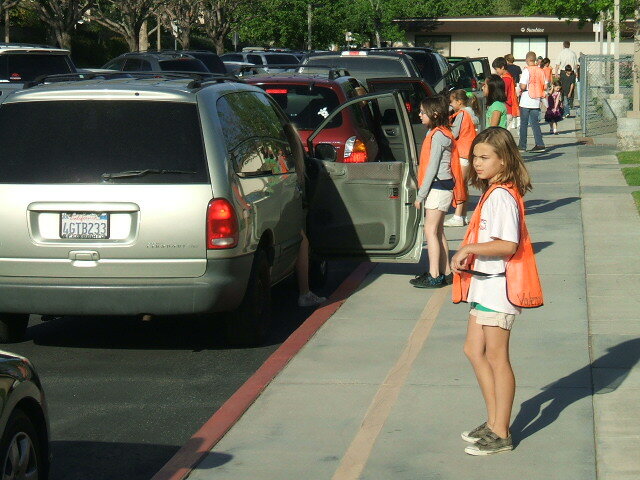 Valet drop-off is a technique to improve traffic flow within the drop-off and pick-up loop by assisting students into and out of vehicles. A “valet” is present at the pick-up/drop-off area to open car doors and assist students into and out of arriving vehicles, improving the traffic flow. The valet system eliminates the need for parents to get out of the vehicle to open the door for a child and remove bags or other items. The valet system is typically staffed by school staff or parent volunteers, who can quickly and efficiently move children into and out of vehicles and hold onto backpacks, umbrellas and other items. Some schools use older grade students as valets, for example 5th or 6th graders help younger students. However, student volunteers must get out of class early to prepare for pickup. A supplement to the valet system is a nameplate in the vehicle window that identifies what student needs to be picked up. This allows the valet to find students and bring them to the vehicle as it arrives. In a platooning system, all vehicles are unloaded/loaded simultaneously, then proceed to the exit. If a vehicle unloads or loads more efficiently than the vehicle in front of it, the rear vehicle must wait for the lead vehicle to finish the unloading/loading, then follow it out of the loop. This tool is best used to control the parent inclination to always drop-off and pick-up the student directly in front of the school. Often additional curb loading is available downstream of the school and is severely underutilized, creating excess congestion and delay prior to entering the lot. At least two monitors are needed to effectively operate the vehicle platoon – one at the loop entrance to direct the maximum number of vehicles into the lot for a single cycle, and a second to ensure that the lead vehicle proceeds to the front-most loading stall. Establishing separate areas for vehicular and bus traffic can help improve traffic flows in the pick-up/drop-off area. Conflicts often occur when private vehicles and buses arrive at the same time and in the same location. Separating traffic often necessitates establishing an off-street bus zone, dedicated solely to buses. Private vehicles should not be allowed to load/unload in the bus zone. Bus zones need to be large enough to accommodate all the buses that might be parking there at one time. Sometimes it is possible to stagger the arrival times of the buses, thus requiring less space. The zones must be clearly marked and there should be adequate sidewalk space for students to wait for the bus. Staggered bell times can help to disperse the traffic peak at schools with a large student population or when two or more schools are in close proximity to one another. For a single school application, students’ start and end time should be grouped by grade levels. The start times of these groups should be at least 15 minutes apart. This allows the vehicles from the first group to leave the school or be completely out of the area by the time the second group arrives. 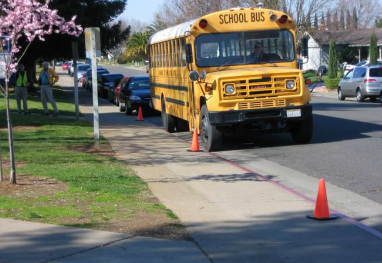 With multiple schools, staggering the bell times can be coordinated among two or more schools to ensure that significant levels of vehicles do not use competing transportation facilities simultaneously. School policies will be coordinated with local sidewalk, crossing, traffic calming and bicycle facilities policies. Bicycling and walking will be included in physical education and other curriculum programs in cooperation with PTA’s and other community organizations. All elementary school children will have the routes they walk or bike to school mapped within a distance of xxxx miles from school. All middle and high school students will have their routes mapped for a distance of xxxx miles from school. will be provided for both students and staff. All crossings within a school zone will be provided with safe crossings designed in compliance with the Manual of Uniform Traffic Control Devices and the ADA, including pavement markings, signage, signals and curb ramps. School Crossing Guards will be located at appropriate locations, will receive technical training and will be provided with safety clothing and equipment. Traffic calming designs shall be provided where appropriate to manage speed and traffic volumes in school zones. The School District will support efforts to promote Walk and Bike to School events and programs, including International Walk a Child to School Day, and safety initiatives such as the Walking School Bus and the Bicycle Train.